A spring primary election will be held in Wind Point on Tuesday, February 19, 2019. The only race on the ballot will be the primary for Racine Unified School District – District 9. 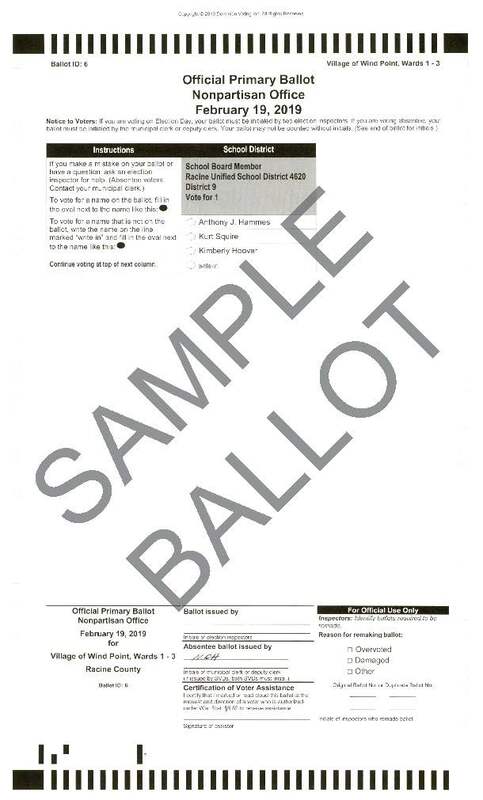 To view a sample ballot for this election, click here. Absentee ballots for this election were mailed out beginning on January 25 to electors on the permanent absentee ballot list and others who already had requests on file for this election. Other electors wishing to receive an absentee ballot by mail may do so by submitting a request online at http://myvote.wi.gov or at the Village Office. Absentee ballots must be received by election day, February 19, in order to be counted for this election. In-person absentee voting will be available at the Village Office from February 4 through February 15 during normal business hours, Monday through Friday 8:30 a.m. to 5 p.m. A valid photo ID is required to obtain a ballot. Residents wishing to register or re-register to vote may do so at the polls on election day, online at http://myvote.wi.gov, by mail or at the Village Office. If you have any questions about the election, please contact the Village Office at 262-639-3524.